Dynamic Comp 2 allows you to share compositions between several projects. 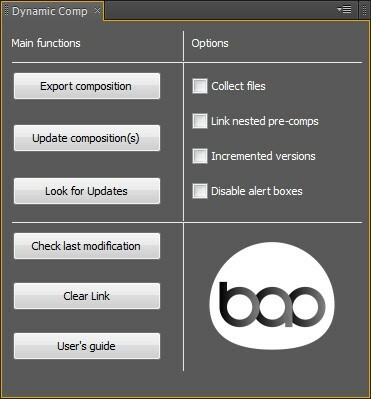 To do so, just select a composition in your project panel, and press the « Export Composition » button. Your composition will be exported as a .aep project, at the location and with the name you'll choose. Now your composition can be used in any After Effects project using Dynamic Comp. So, what's the difference with just importing the composition's project? Your comp is now linked to a reference project, and you can update it when ever you want ! All this without leaving your actual After Effects project ! Download the free trial and try it out for yourself.